Originally published in Journal of Creation 15, no 2 (August 2001): 4-6. Our understanding of ostensibly long-lived radioactive ‘clocks’, in the light of the Creationist-Diluvialist paradigm, must necessarily consider both geologic and physical factors. Among the latter are decay-rate changes, and these may include a variety of superimposed processes occurring at the same or at different times in the several-thousand year history of the universe. Up to now, creationist research has summarized evidences of small decay-rate changes, as well as theoretical analyses suggestive of the possibility of more extreme changes in radioactive decay rates (the latter usually dependent upon corresponding changes in fundamental physical constants1). Here I report the experimental demonstration of radioactive decay-rate acceleration by an astonishing nine orders of magnitude. It requires special conditions but, in and of itself, no alteration of known physical constants. This acceleration can occur under beta (negatron) decay. During b decay itself, a neutron changes into a proton, electron and electron-antineutrino, and the electron is expelled as a negative beta particle (b- —often written without the negative sign, but sometimes it is necessary to distinguish it from the rarer positive beta or positron decay b+). Because the protons in the nucleus and the b particles have opposite charges, they attract each other, and the b– must therefore acquire sufficient kinetic energy to overcome this attraction in order to escape the nucleus. This has been likened to a particle having sufficient energy to crash through the walls of a well.2 In some b– emitters, the successful escape of a b-particle into the continuum is a relatively infrequent occurrence—hence the inferred long half life (t½) of the nuclide. (a) Atom showing the 1s electron orbital. The orbital is full. (b) The same atom in a completely ionised state. The atom has been stripped of its electrons. The energy required to escape an atom when the electron shell is filled (a) is greater than the energy required for the electron to jump to a vacant spot in an electron shell (b). r* is the distance from nucleus where finding an electron is most probable. For a 1s orbital r*=a0/Z where a0 = Bohr radius @ 52.9 pm; Z=atomic number. The foregoing discussion assumes that electrons surround the nucleus, which of course is nearly always the case. For over 50 years, however, some theoreticians had suggested that negatron decay could be altered in the case of a nucleus bereft of its electrons (as occurs in a plasma state). Perhaps the b-particle attempting to leave a bare nucleus would have to overcome a much lower threshold of kinetic energy than if the electrons were present. 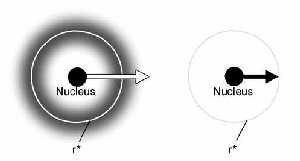 The fleeing b– particle could take refuge in a vacant electron orbital around the nucleus instead of attempting to escape all the way into the continuum. This process is called bound-state b– decay (or bb decay). Subsequently, theoretical analyses3 suggested that a significant perturbation of radioactive decay rates could occur in the nuclides of 25 different elements as a consequence of bb decay. Experimental demonstration of the actual existence of bb decay, however, did not occur until the 1990s. 163Dy, a stable nuclide under normal-Earth conditions, was found to decay to 163Ho, with t½ = 47 days, under the bare-nucleus conditions of the completely ionized state.4 More recently, bb decay has been experimentally demonstrated in the rhenium-osmium (187Re-187Os) system. (The Re-Os method is one of the isotopic ‘clocks’ used by uniformitarian geologists5 to supposedly date rocks.) The experiment involved the circulation of fully-ionized 187Re in a storage ring. The 187Re ions were found to decay to a measurable extent in only several hours, amounting to a half-life of only 33 years.6 This represents a staggering billion-fold increase over the conventional half-life, which is 42 Ga! (Ga = giga-annum = a billion (109) years). Now, let us visualize the following situation at the beginning of Creation Week. As God creates the atoms which will subsequently be assembled into all of the matter that will constitute all of the objects in the physical universe, He first creates them all in a completely ionised state (i.e. nuclei alone). This plasma persists for several hours on the First Day, during which time bb decay freely takes place under the bare-nucleus conditions of all of the atoms. This process, though, is insufficient by itself to generate billions of years’ worth of excess 187Os.7 However, if there were a simultaneous weakening of the presently-existing nuclear force, as suggested by Humphreys,8 the Re-Os ‘clock’ would be accelerated another few orders of magnitude. Not only the Re-Os clock, but probably many other radioactive (and even stable) nuclides would experience appreciable amounts of bb decay under the bare-nucleus conditions of the plasma. We note that the potential or actual bb decay gives a large ‘head start’ to extreme accelerations of radioactive decay. Thus the postulated weakening of the nuclear force7 may need to be far less drastic than originally supposed (when assumed to be acting upon non-ionized atoms) to generate billions of years’ worth of decay products in several hours. It turns out that bb decay is not the only mechanism by which some ostensibly long-age ‘clocks’ can experience major accelerations in radioactive decay rate. Consider the lutetium-hafnium (176Lu-176Hf) system, which is relatively new, and which is infrequently used by uniformitarian geologists to supposedly date rocks.9 At very high temperatures, part of the 176Lu decay to 176Hf bypasses the conventional slow route, and goes into an isomeric state which has a half-life of only 3.68 hours.10 In other words, part of the 176Lu decay experiences an alternative decay mode to 176Hf which represents, in effect, a shortcut that is 14 orders of magnitude faster than the conventional 176Lu decay (t½ = 41 Ga). Moreover, in this particular instance, no changes in the nuclear force are necessary. Extreme temperatures suffice, and the greater they are, the shorter the effective half life of 176Lu decay to 176Hf. In terms of specifics, at temperatures below about 200 million K, t½ remains unperturbed at about 41 Ga. But, over the interval of 200 to 300 MK, the effective t½ drops precipitously (by nearly 10 orders of magnitude), then begins to level off asymptotically at still higher temperatures. Thus, at 600 MK, the effective t½ of 176Lu is only about 8 days!11 This is short enough that if, as discussed earlier, all of the atoms in the universe had been created in a very hot state—which just means very high kinetic energies—(and maintained that way for several hours on the First Day), all the excess 176Hf in existence would have been generated within that short period. The rapidly-accumulated products of the accelerated radioactive decay subsequently became part of every object in the created universe, albeit at differing concentrations. During the remainder of the Creation Week, as God cooled and organized the plasma into solid celestial objects, such as planets, the excess radiogenic isotopes became partitioned into the relevant mineral phases, perhaps according to accelerated geochemical processes. The modern uniformitarian geologist misreads this deployment of the radiogenic isotopes as isochrons indicative of up to billions of years to time. This span of time never happened. 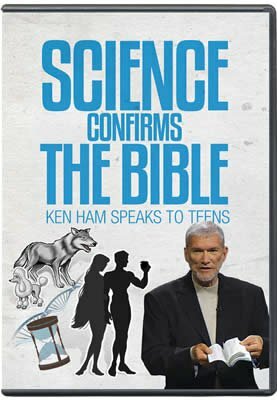 This exciting demonstration that isotopic ‘clocks’ can be accelerated at least a billion-fold is good news to creationist scholars. It raises fundamental questions about the temporal stability of isotopic ‘clocks’. What else have we failed to consider in terms of the physics of radioactive decay? The myth of the virtual invincibility of radioactive decay to external forces has been decisively shattered, and the door to further research has now been swung wide open. Chaffin, E.F., theoretical mechanism of accelerated radioactive decay; in: Vardiman, L. et al., Radioisotopes and the Age of the Earth (right), Institute for Creation Research, El Cajon, California and Creation Research Society, Missouri, 305–331, 2000. Alpha (a) decay has also been likened to particles bouncing around inside a well (a potential energy well created by a combination of nucleus’s positive charge and the ‘strong’ nuclear force) until some of them acquire sufficient kinetic energy to jump through one of its walls: Humphreys, D.R. Accelerated nuclear decay: A viable hypothesis? in: Vardiman et al., Ref. 1, pp. 333–379. This is the standard Gamow theory, and is often referred to as quantum mechanical tunnelling. In a-decay, the electrons are largely irrelevant. Humphreys suggests, based on an application of the standard theory, that a small diminishing of the nuclear potential, however, has allowed a-decay to be accelerated a billion-fold or more. Takahashi, K. et al., Bound-state beta decay of highly ionized atoms, Physical Review C36(4)1522–1527, 1987. Jung, M. et al. First observation of bound-state b– decay, Physical Review Letters 69(15)2164–2167, 1992. Woodmorappe, J., The Mythology of Modern Dating Methods, Institute for Creation Research, El Cajon, California, 1999 (top right). See pages 25, 49, 67–68 for the many fallacies of the Re-Os dating method. Bosch, F. et al., Observation of bound-state b– decay of fully ionized 187Re, Physical Review Letters 77(26)5190–5193, 1996. For further discussion of this experiment, see: Kienle, P., Beta-decay experiments and astrophysical implications, in: Prantzos, N. and Harissopulus, S., Proceedings, Nuclei in the Cosmos, pp. 181–186, 1999. Note that bound-state bb decay accelerates the Re-Os ‘clock’ by 9 orders of magnitude. However, in order to compress 4.5 Ga worth of ‘normal’ radioactive decay into the several hours of the First Day of Creation Week, the Re-Os ‘clock’ would need to be accelerated by another 5 orders of magnitude.There has been some concern expressed that radioactive decay would be inconsistent with God creating the universe ‘very good’. There is always the danger of reading too much into the ‘very good’ statement, and the context indicates that ‘very good’ refers to the absence of suffering and death for man and other sentient creatures before the Fall. Radioactive decay does not, of course, have anything in comon with the death and decay of sentient beings. Moreover, radioactive decay involves the transformation of one nuclide into another, and does not have any connotation of imperfection in the Creation. Humphreys, Ref. 2, p. 362. For a discussion of some of the flaws already evident in the new Lu-Hf dating method, see Woodmorappe, Ref. 5, p. 68. Kappeler, F., Beer, H., and K., Wisshak, S-process nucleosynthesis—nuclear physics and the classical model, Reports on Progress in Physics 52:1006–1008, 1989. Klay, N. et al., Nuclear structure of 176Lu and its astrophysical consequences, Physical Review C44(6):2847–2848, 1991.